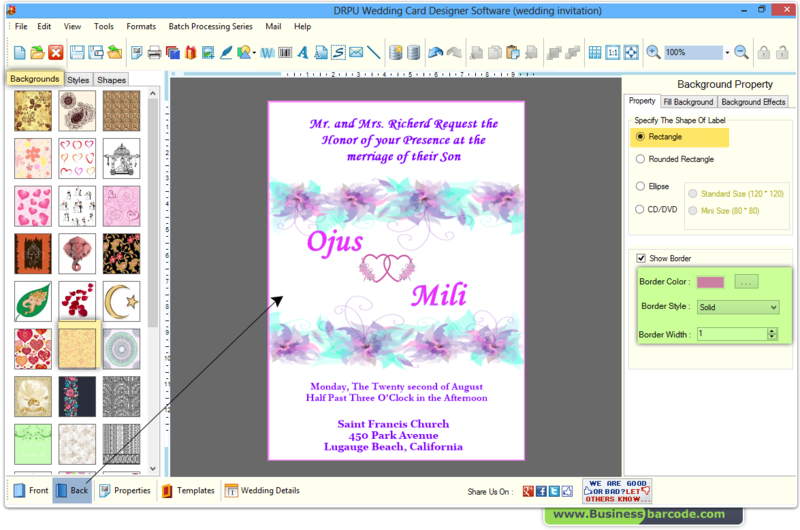 Make your own wedding invitation cards with wedding card maker software! Attractive wedding invitations card not only please your guests but also show nature of your wedding party. Wedding invitation card is symbol of your concern for your guests. With wedding card maker software, you can design creative wedding invitation card just in few simple clicks. Wedding card maker software easily makes designer wedding cards for your guest to feel them that they are really invited by wholeheartedly. Wedding card maker program designs invitation cards in Rounded Rectangle, Rectangle, Ellipse and CD/DVD shapes as per your need. Creates high resolution, beautifully designed customized wedding cards. Enable you to insert image from library during Wedding card designing process.